I was going to wait to short oil until Wed morning, but then I came across this article today (article) which stated China will increase gasoline and diesel prices approximately 19cent per gallon today. That's huge. If I were in crude right now, or still in oil stocks, I would take a hard look at selling them in this strength, and wait for a pull back. Crude has broken from fundamentals, and it has become a pure momentum play at the moment. (ie short candidate) The technicals are indicating a very much over bought condition needing to consolidate the move. I will be looking to short it today for a decline to its consolidation (low 60s). While I would love to see Oil decline to $50/barrel, I am not expecting the momentum to simply stop unless the equity markets decide to break down. 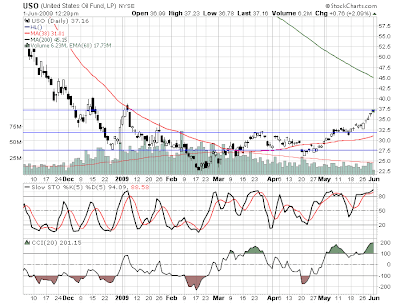 Closed the DUG trade--confused about the dollar's impact on oil price. I still believe in your thesis and I think Goldman is talking their book, but I'll look again next week.